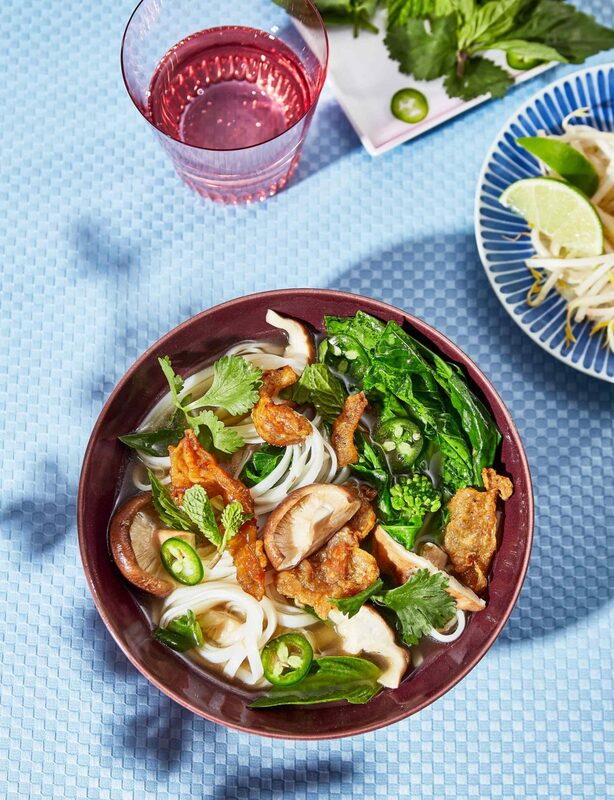 Spices add complexity to a simple chicken broth, while traditional fixings create hearty satisfaction with this easy gluten-free Vietnamese-style noodle soup. Place the rice noodles in a large heatproof bowl. Fill a large pot with water and bring to a boil. Carefully pour enough boiling water over the rice noodles to cover. Let sit for 15 minutes while preparing the soup, then drain and reserve. In a medium stock pot, bring the chicken stock, cinnamon stick, star anise, cloves, and ginger to a boil. Reduce the heat, cover, and simmer for 25 minutes. Using a slotted spoon or small sieve remove and discard the spices and ginger. Stir in the fish sauce, brown sugar, and tamari. Add the mushrooms and greens to the broth and simmer for 5 minutes. Taste the broth and adjust the seasoning as needed with fish sauce and sugar. Divide the noodles between two soup bowls and cover with mushrooms, greens, and broth. Top each soup with fresh herbs, bean sprouts, cracklings (reheated in a 350°F oven, if not freshly made), green onion, and a few jalapeño slices. Serve with lime wedges. MAKES ABOUT 1/3 TO ½ CUP FAT AND ¼ CUP CRACKLINGS Slow-frying chicken skin until it’s chip-crisp and golden brown results in irresistible crunchy and delicious cracklings, as well as rendered chicken fat that can be used as cooking oil. In a cold skillet, place the chicken skin in one layer. Turn the heat to medium-low. Cook the skin, turning often, until the skin is rich golden brown and completely crispy, 35 to 45 minutes. Using tongs, remove the crispy skin from the pan, letting any excess oil drip back into the pan. Transfer the skin to a small baking sheet or glass container. Pour the rendered chicken fat from the pan into a glass jar with a lid and reserve for another use.